And I lost out in my battle by one vote! One vote! Even though I'm not moving on to Round 2, I'm still pretty durn pleased with myself and with my entry. I pushed myself harder than I've pushed in a long time, and I'm very happy with the result. I completed my entry on time and met the deadline. And I got so much amazing feedback, both before and after the results of the first round of voting came in, that I feel like this is a great personal success for me. There was, as to be expected, some backlash after the results of the first round were announced. And I was just gobsmacked to see how some people reacted after being eliminated or after their favorite pieces (not pieces that they made themselves) were eliminated. Cries of "foul" filled the Battle of the Beadsmith Facebook page, even as most of us who were eliminated were graceful and just happy to have participated in this event. What surprised me most was all of the criticism that was unleashed after the results. People were hurt that their work wasn't voted on the next round, and more than one person even suggested that the competition never should even have taken place. People complained about the judging - there were no set criteria! How were these pieces judged? How could someone come up with a competition that pitted one bead artist against another? Now, here are my thoughts. And I'm sure I'm gonna piss off a few people here. I talked to my sister about the competition, and as a working artist herself, she had some very good points. Yes, there were some amazing freaking pieces of beadwork that were voted into the second round, but all of the pieces were amazing. True story: after selling my handmade fused glass very successfully at the farmer's markets throughout the summer of 2008, I started taking it around to a couple of local craft stores to see if they would be interested in either consigning it or wholesaling it from me. I remember one store owner in particular who told me that my pieces would never sell. Whatever. 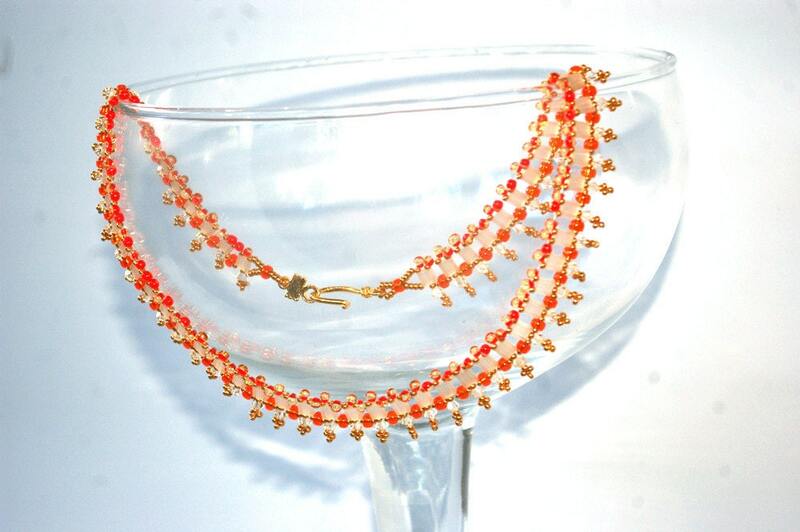 I took it with a grain of salt, and went on to have two more very successful summers of selling my handmade glass and beadwork at my local farmer's markets and craft shows. 5. Just because there are some awesome pieces in this competition that got voted out in the first round and people's feelings got hurt doesn't mean that the competition should never have happened in the first place. I can't imagine even making that statement. I'm sure there are dozens, if not hundreds, of entries into competitions like Bead Dreams and Bead Star that get booted out in the first round, but has anyone said that those competitions should be shut down? Heck, no! 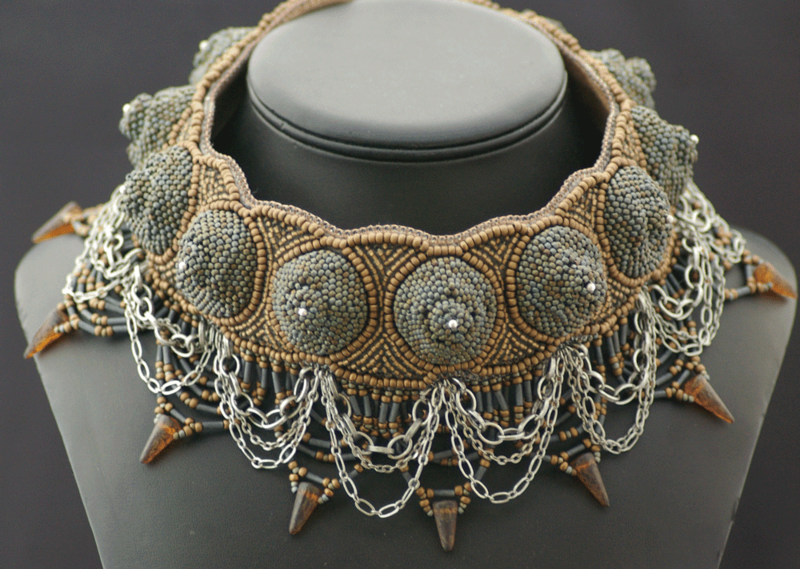 Those competitions have resulted in the recognition of some of the most important emerging bead artists in recent years! Remember: your art comes from YOU, and the great thing about it is that no one can duplicate your own artistic vision. If you didn't make art, would you be miserable? I certainly would. Making art makes me a happier person, and I really don't care who does or doesn't like it. In the end, if I like it, that's good enough for me. Personally, losing round one by just a single vote was a big win for me. I never dreamed that I could hold my own against such an amazing piece, but I did! And the feedback I got about my entry - that it was risky, edgy, and unabashedly unique - means more to me than any "win" could. 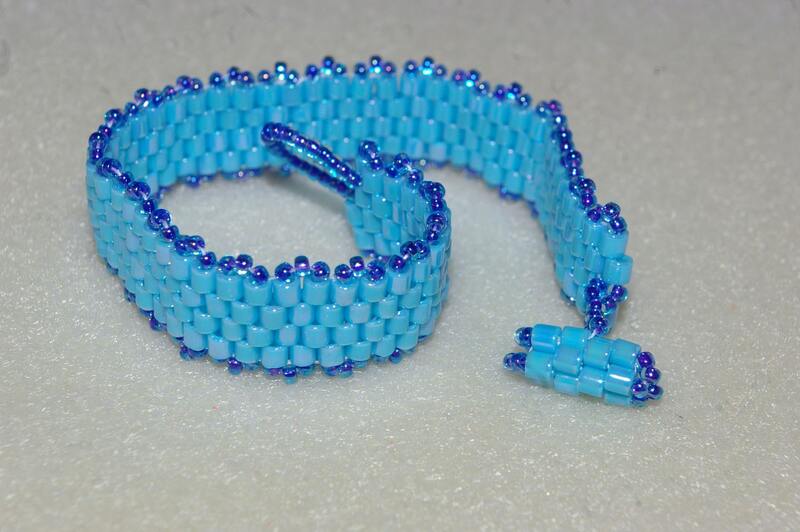 So, if you want to enter a beading competition, go ahead and enter. But do it with your eyes open, and with the knowledge in your heart that even if you don't win, yes, you are good enough. Well said! I voted for you by the way, and apparently 59 other people did, and you are a winner in my book and in the grand scheme of things, winning does not even matter. I think competitions get us trying harder and the outcome is beautiful artwork. I don't want to know what the 121 judges based their decisions on, since beading is not measured by objective standards, like weight or price of materials...You are right about being judged all the time too. By creating art, you invite criticism, and some people will like what you do, some won't. And we can either live with that, or not share our creations with the world. I understand the hurt feelings, and feel the pain, but let's move on to the good part, celebrating all the beauty that we brought into being by entering this competition. Right on, Jen! You should be so proud of what you designed...and proud to have competed. I was just talking to Melinda about this yesterday... that I am so glad I didn't compete because there is nothing I could have designed in that short time frame that would have been at the caliber it needed to be. Your piece was, and just for that alone, you win! Brava! Beautifully said and perfectly true. Great post. I personally loved your work and voted for it. Yes, there was hurt, I was one who expressed it: to deny it would be a lie, however it's time we all move on and celebrate. I'm pleased of what I accomplished; this is my best so far and it's already sold. I appreciate your input on the judging process. As one of the judges, I can say that it personally hurt me to vote in some of these pairings, knowing that only one of two incredible pieces would move forward. As a longtime artist, I can say that one MUST develop a thick and impenetrable skin regarding criticism of one's work. Otherwise, the emotional cuts would be too painful to keep going. Kudos to you for being a graceful voice of reason. Your piece was striking and very creative. I'm glad you are OK with the result of the vote. Great post! You have such a great attitude. I must say that I was surprised by the anger, vitriol, and, frankly, pot-stirring that followed the first round of judging. 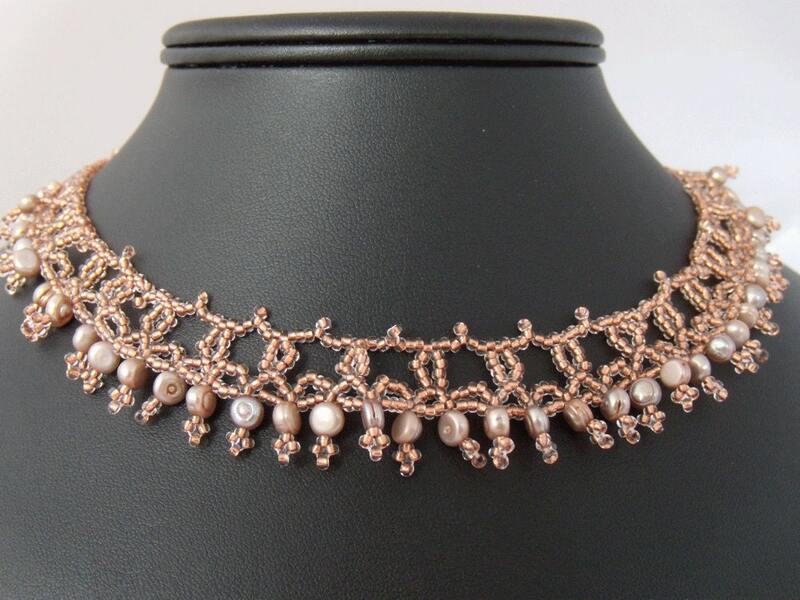 When I look at the competition, what I see is a lot of great and inspirational work and exposure for some well-known and new names in the beading world. I think it's fine that it was held in the form of a competition because the idea of a competition with a hard deadline tends to get people's engines going much more so than does a kind of nebulous suggestion that "everybody make something pretty and let's all look at it." I was amazed by the work that was produced, introduced to the work of artists I'd never seen before, and thrilled that so many beaders got jazzed about an idea all in one place. One of the criticisms I keep hearing is that competition creates some kind of a pack mentality that somehow strips your creativity. I thought your piece was really fresh and out-of-the-box. I know (BELIEVE me!) how difficuly it is to hear "no", but your attitude about the whose experience is inspirational. You're kinda my hero, you know? Well said! In the spirit of competition, your ethics shine, you are a winner, you believed in your work and took a chance, again you are a winner! YES! I can understand some of the feeling that setting up artist vs artist is destined for hurt feelings, more so than a contest like Bead Dreams though. If you are upset/hurt that you didn't win in that contest it's more of a general grouch....to say you feel cheated in a contest like the Battle you are actually saying you think your piece was better than your opponents....and that is more direct and can cause more hurt feelings. That said...we knew the caliber of the beading in the Battle was going to be high, we knew the first round would cut us in half, we had a 50-50 chance of being cut. This is not a contest for the fragile ego and I feel this is a contest that should be entered for the journey not for the win. You have the right attitude about it, I voted for your piece, it was so refreshingly original, I love it! This contest coaxed a lot of brilliant bead work out of us and I for one appreciate it for making me stretch and giving me a reason to do a large piece. The win is in the piece I created and the viewing it got. Very well said! 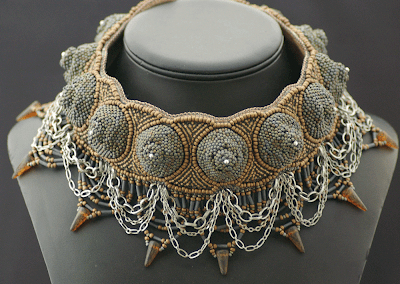 I am just dipping my toes into the community of bead artists. I am incredibly impressed by the talent and creativity of this amazing group. I am especially grateful for the nurturing attitude, support, and friendly attitudes i have encountered. I have been following the BOTB and have seen far more positive comments than negative. I feel for the artists that did not move on - the dissapointment must be acute. As an emotional person, however, I've learned that it is always good to take a bit of time to settle your feelings before putting them in print :D...i also echo what others have said: you're all winners! This been such a fun and inspiring contest! So many wonderful artists and spectacular work. I agree with Jennifer and Mikki. Even if you did not go on to the next round, you were inspired, you made new friends, discovered new artists, got to see some of the most beautiful artwork in the world, competed with artists all over the world and been a part of the beginning of a competition that is sure to morph into one of the biggest Beadwork competitions ever! Since this was the maiden voyage lots has been learned allowing for a bit of tweaking for the next one. And we still have more to go! I adored this piece. Just as an FYI. Well, durn skippy! For me, just being among the gods and goddesses of beadery was a WIN. I was happy to be there as cannon fodder for the rest of you guys. And then to be up against one of my idols (GoodQuillHunting), well that was a priviledge. I was hoping I would move on...cause ya kinda hafta hope...but I surely didn't expect it. So, I guess all that is easy for me to say since I am moving into round two (they need cannon fodder there as well!)... but I was very surprised at some of the negative comments. On the whole, the attitude of the participants has been generous, upbeat, inspirational and professional, and I think it will continue on that way. I feel sorry for his part has not passed the first round ... And I congratulate you because he learned to accept it with great style!!! Thank you! common sense at last regarding the battle. I confess to not visiting the page properly since the results came in but I've seen a few posts via my news feed and it was a bit depressing all the negativity and general hostility (i had noticed it starting previously). I have only been a spectator but I felt I had a better grasp of the concept than some others. the way I saw it, you were all invited proving your work had been recognized ad being a high standard. its a competition there will be "losers" if you can't handle it don't enter. there was no entry fee and there is no prize other than glory. all pairings were published you knew who you were up against research can be a very important tool if winning is that important, Stephen salad right at the start that this year was essentially a dry run to see i a battle could be waged and that things would possibly change along the way and I'm very sure that things will be done differently in future battles. A wise and talented lady .. I stayed away from the aftermath of round 1 judging .. glad I did ... Congratulations to all everyone is a winner in this contest!! Thank you for saying it so well! In the process, you remind me of all the good reasons for entering beadwork competitions in the first place. Your piece is wonderful. If entering the contest brought this out of you, then it was a huge success. BOTB observer here...I missed that negative backlash so was unawares, except for later references to it. Right on the mark with your post here. I probably would have passed out if I had been asked to participate (you know, like 10 years in the future if I ever achieved a level worthy of such an invitation), so that would have been an automatic win for me. And I also wanted to take this opportunity to tell you that your piece was one of my very, very favorites of the competition. Worthy of a Warrior Princess. It's downright awesome and bad to the bone. Very well said and I loved your piece as well! Well said. I looked at all the pieces and they are all beautiful, but like you said - someone has to win and someone has to lose, and I don't think the judges would have made their decisions lightly. Good on you for entering. Good on you Jen! Great attitude and all true. Very well said, Jen! As one of the non-participating judges, I can tell you that it was extremely difficult to choose, and one of the reasons for the difficulty was in knowing that some pieces wouldn't move on. I spent hours looking at all the entries as they were posted, and then spent even more time looking at the final shots in each Battle. It's sad that some feelings were hurt to the point where people lashed out at Steven about the Battle, but it's heartening to see that not everyone reacted that way. Well said! The negative comments about the competition and/or judging process really put me off. I've entered my work in competitions and juried shows. Sometimes my work has been accepted or won prizes, sometimes not. Regardless of whether I "won" or "lost", my work and my confidence has grown with every risk. Isn't that the real point in trying? Your piece is absolutely beautiful, and your attitude is both gracious and logical. Kudos! Excellent blog! Each point is worth keeping in mind. I won my battle at the very moment when I decided to participate! I do not think the judges have voted for a "name" but for the beauty of their favorite pieces. And who does not accept this judgment has understood nothing of the spirit of the "Battle"
Wonderful post, and I couldn't agree more with everything you've said! Thanks for putting such a wonderful perspective on things. This is why I never ever enter a contest that requires a popular vote. Some people advertise for votes and some don't and I just can't ask for votes. If it's a panel of judges, that's one thing, but I don't like the fact that someone can be stellar and have 48 friends and someone can be not so stellar and have 458000 friends and win that way. That probably makes me sounds horrible, but that's why I don't compete in that sort of competition. What a great post! It always amazes me just how sore of losers that people can be. I judge a lot of writing contests and in my mind, the best part of entering a contest is not the winning but the constructive criticism that one gains. And your attitude makes you a winner regardless of the votes.